Make it casual for everyday use, or elegant for those refined nights. This long zip purse/clutch/wallet is made from real Italian black leather, and is the must have accessory for ladies everywhere. With a classic shape, and designated areas for cards, cash, and coins, this is the best grab and go piece. With a lightweight feel, and sleek look this personalized leather clutch will be your new 'go to'. Create it with name or initials as monogrammed leather clutch too. Service was fantastic, Emails were quick and precise. The zip purse arrived faster than I thought it would, The color was a little darker than I thought it was but that was my fault for not checking the color of the picture, the stitching was tight and there were no loose threads or extra oilcloth, best part the zipper doesn't stick! Thank you so much for a beautiful product! The leather wallet is simply awesome. The graphics were clear and I got it the same week I ordered it. Easy to use, quick turnaround, and good quality final product. This was a great gift to give. It is really personal and extremely useful! Like many of our products, the personalized card wallet comes with a quantity discount, so buy one for all the family today and save money. 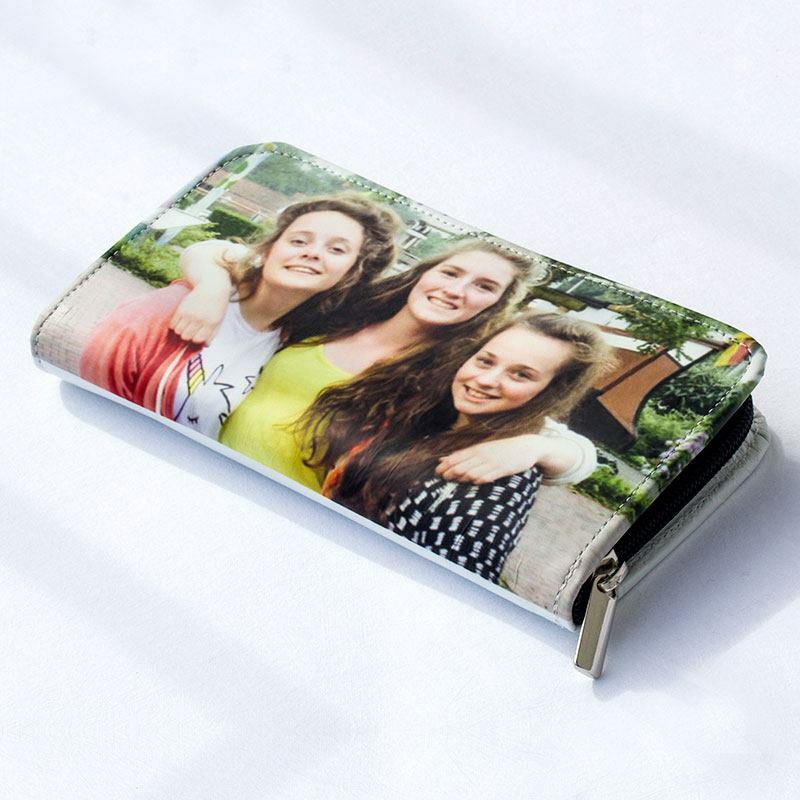 We print your photos onto either the soft leather or oilcloth as one big piece that’s then stitched to the purse itself by our team of fabric experts. Everything is done by hand so your personalized purse really is unique in every way. Your colors will stay fresh and vibrant for years to come thanks to our specialist printing process. Care: for both the personalized leather purse and oilcloth photo purse, wipe down with a damp cloth. Do not machine wash. When customizing your purse, consider that the photo area is one big piece of fabric, so having 2 different photos will mean there’ll be an interruption at the fold, however, this is hardly noticeable. Floral or mosaic designs look incredibly trendy, and what’s better is that nobody in the world will have the same one. Bring forgotten family photos back to life and give your loved ones a personalized purse that brings back happy memories. Or personalize this photo purse with your mum’s star sign and add text to describe their lovable characteristics. Purses can often be regarded as just a necessity, however, they’re a great accessory to show off your personality and sense of style. Give your girlfriend her own personalized purse printed with a photo of your first date or anniversary – she might just love you that little bit more! For your money-conscious friend, make their money counting even more of a delight and surprise them with a photo purse printed with a funny photo. Personalized photo purses are also great for girls who should count their pennies more often, and what better way to do so than with a bespoke purse made just for them? High quality personalized photo handbag with satin print custom made for you. Available in two sizes to best suit you. Design your own zip top handbag personalized with your favorite photos and text. 100% secure zip top shoulder bags.